For many people, lilacs are a sentimental flower. My mother planted many lilacs on our farm in Kansas. The scent carried across the yard as I played. When my husband and I started our family, planting a lilac in our garden was a priority so our children will have the same heavenly memory of the fragrance and flower. Fill a bucket half full of fresh, cool water, and have it at hand as you cut blooms. Pick flowers in the cool of the morning or evening. 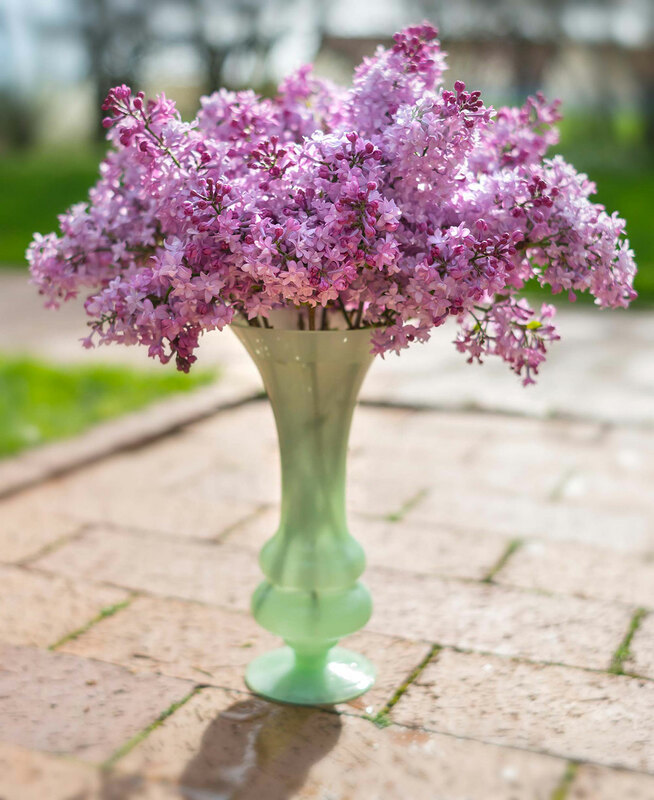 Lilacs open very little after harvest, so choose stems that have at least three-quarters of the flowers open. Next, remove all of the leaves so the plant isn’t putting its effort into keeping the leaves hydrated. Place stems in the water. Leave the bucket in a cool, dark place and allow the flowers to take up water for at least an hour. Pick flowers in the cool of morning or evening. Remove all of the leaves from each stem. Next, using heavy clippers, recut the stem ends, then slice vertically up the stem 1-2 inches. Grasp one side of the sliced stem and twist backward. 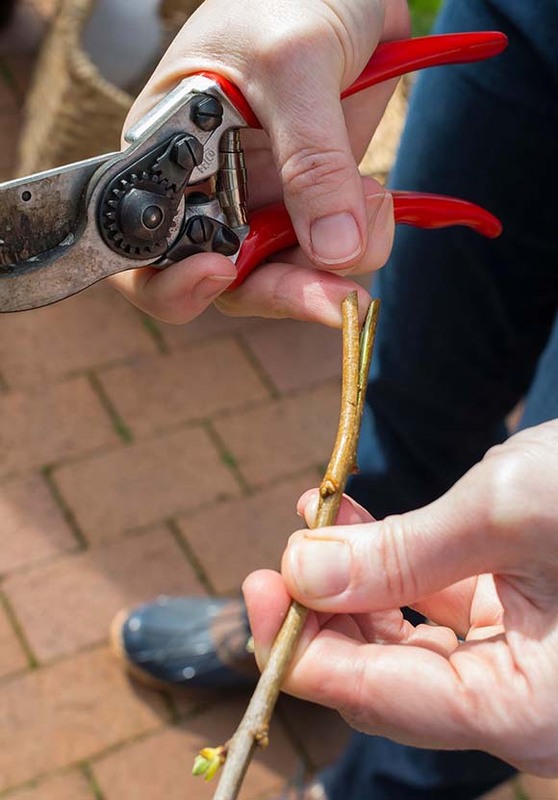 Immediately place the cut stems back into the bucket of water. Allow the stems to take up more water in a cool, dark place for another one to two hours. The lilacs will then be ready for arranging, and will last three to four days. Recut the stem ends, then slice vertically up the stem 1-2 inches. Grasp one side of the sliced stem and twist backward. Thank you! I always wondered why cut lilacs droop so quickly. I’ll try this method. We always smash the ends with a hammer… they last forever! I agree with you, Betty. 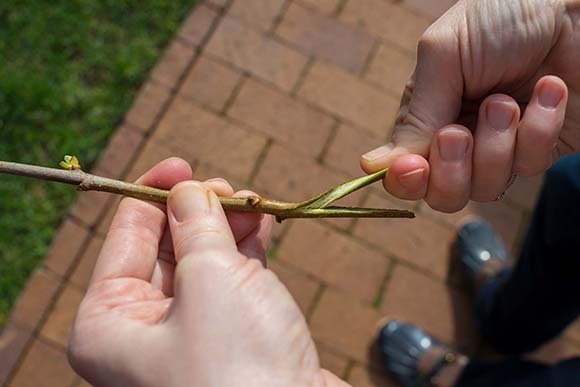 My mother, who was so very interested in flower arranging always pounded the ends of the twigs where they were cut. She said this would make them last longer in an arrangement. Thank you for this. I’ve tried several things but within a few hours my lilacs are really wilted. I will try this technique! I really miss lilacs here in SE Texas. The fragrance is so marvelous. The one room school that I attended as a child had a large area, grove-like, in front of the girls’ outside. My classmates and myself loved playing there in the spring. Please, can you share how andwhen to replant them, how to care for the new plants, and what to expect? I have an excess of bushes in one location and I want to spread them around to a few nearby places where none exist. The lilac bush was outside our dining room window and we left the window open when the lilacs were in bloom. I miss the fragrance in doors. The neighbor has a large lilac bush that over hangs the yard and now I know how I can bring in the blooms and enjoy them. Thank you. When is it best to transplant to different locations ? How deep of a dig and tried for years to plant at my aunts house but they always dies !! Hi, Kate. That’s an excellent question, and deserves a thorough answer which may be too long to post here, and may apply to your particular situation in your yard. I’ve forwarded your question to our Plant Information Service team for a reply. You can also find them online for all your other plant-related questions on Facebook or use their online form at chicagobotanic.org/plantinfoservice. Thank you! Thanks so much for these ideas. I too grew up with a wonderful lilac bush. Several years ago I planted a dwarf lilac which has done quite well in Chicago weather conditions. Sweet memories! Hi, Kate. 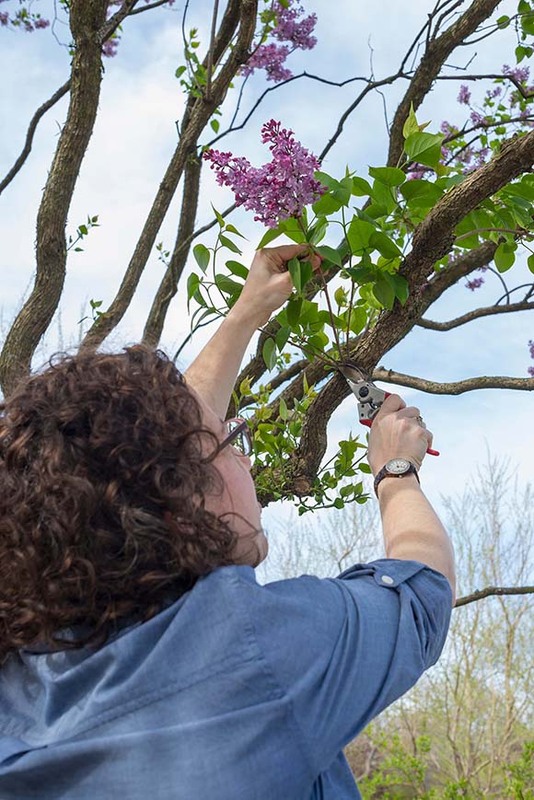 Ideally, the best time to transplant lilac shrubs is in early spring, before the plants leaf out, or in the fall after all leaves have dropped. You can also move the plants just as they begin to leaf out. Moving the shrubs at other times of the year can be extremely stressful to transplants. Shrubs should be planted at the same depth as they were growing in their original location, or slightly higher. You should attempt to dig as much of the root ball as possible and dig the hole at least one to two feet wider than the root system. Newly planted shrubs require approximately one and a half inches of water per week. If Mother Nature does not provide this amount, then you will need to supplement. If supplemental water is necessary, it is always best to water one time per week as opposed to several times per week. 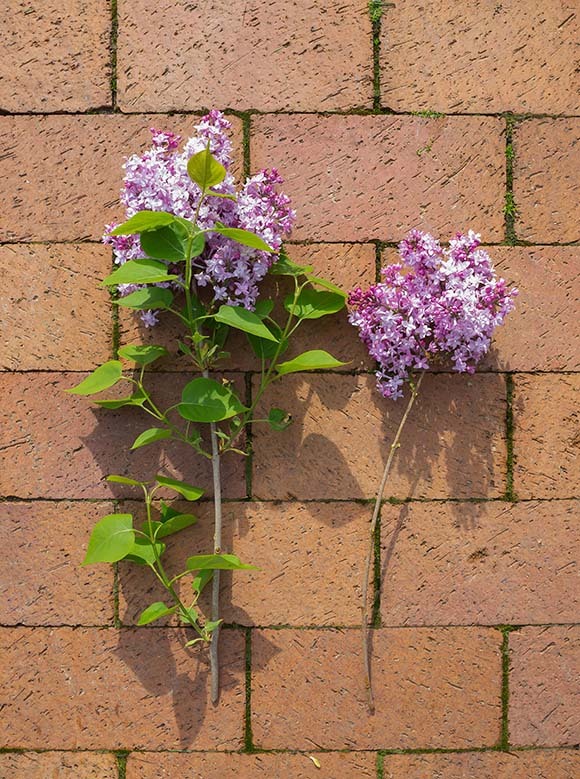 Please reach out and tell us more about the previous times that you transplanted lilacs unsuccessfully and we will help you determine what may have gone wrong and how to prevent it from happening in the future. Contact Plant Information directly at plantinfo@chicagobotanic.org or (847) 835-0972. Thank you! Thanks for these hints. I have the same problem with my cut lilacs not lasting long in the house, but I still always bring some in because I just love the scent, and, the look of them. Never heard of these tips, but will try them soon. Lilacs are one of my most favorite flowers, though they are a bit underrated. I think they look gorgeous in combination with roses, mums or even by themselves. Fortunately I have some lilac trees near my house, but they never lasted long in a vase… But once I’ve ordered an amazing bouquet with free delivery on this page http://vipiris.com/usa.html and they sent me an arrangement of freshest lilacs and roses which lasted almost two weeks! Now I know how to make them last that long, thanks! Previous Previous post: What Are the Best Plants for Your Midwestern Garden?